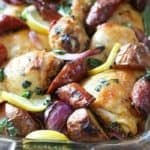 Chicken, Sausage and Potatoes all in one pan! This meal takes about 10 minutes to throw together and checks all the categories we love around here. Fast, Fresh and Healthy with tons of flavor! This is it guys…this is your new ‘feed the family before they eat all the Cheetos’ dinner. If you make this once, you will make it again and again. Change up the sausage, change the potatoes, spice it up or tone it down. Any way you do it, this comes out perfect every time! 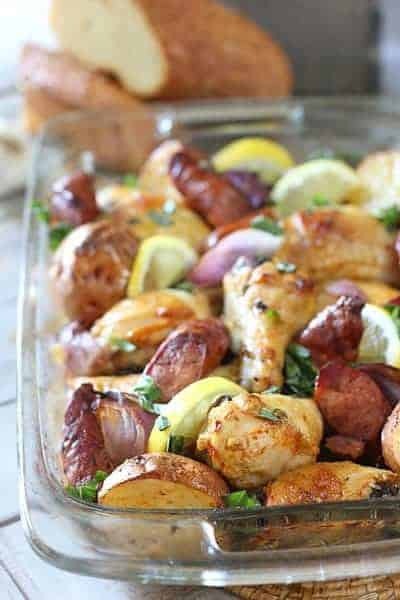 How to make One Pan Roasted Chicken, Sausage and Potatoes! No need to pre-marinade. Just whip up a simple sauce of lemon juice, garlic, paprika and olive oil. Shake it up and pour it on! Add your chicken, taters, some onion if you have it, and sausage, to a regular old 9 x 13 baking dish. That old baking dish never looked so good! Pour on the marinade and toss. Bake for an hour and you have a really great, healthy dinner that will feed 4-6 people easy. Depending on the quality of your sausage, this meal is super healthy and made with whole ingredients! Not to mention Paleo (with sweet potatoes) and Whole30 compliant! I used Aidells Andouille sausage that was precooked, but you can use uncooked fresh sausage as well. Just slice them up and toss them in. If you are watching your calories, try to stick with a chicken sausage. 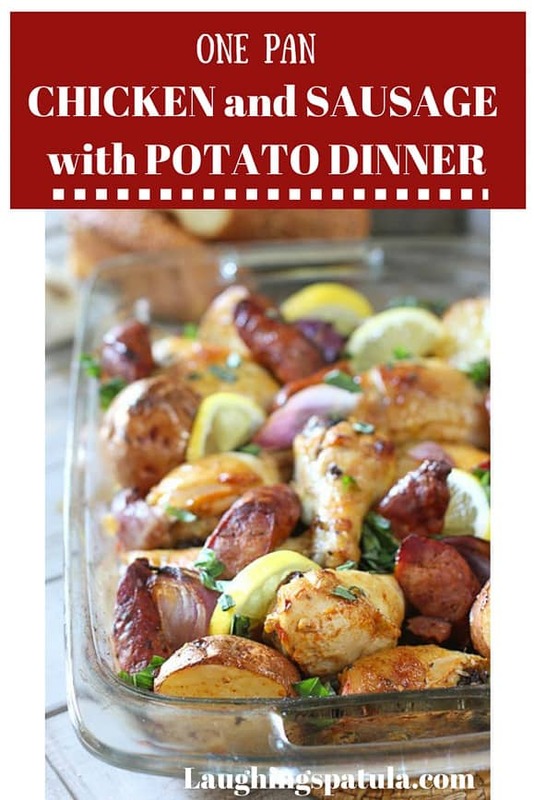 Notes to make this Easy One Pan Chicken, Sausage and Potato Dinner! Use bone in chicken. I used a combo of thighs and drumsticks. Bone in will ensure the potatoes and sausage get cooked up at the same time. Whole small potatoes work great. I couldn’t find them at my store so I bought larger ones and just cut them in half. You want them rather large so they don’t get over cooked. Don’t have smoked paprika? Just use regular but I do like the smoky flavor it imparts. It’s really hard to mess this dish up. Keep it simple and fresh and you are gonna love it! 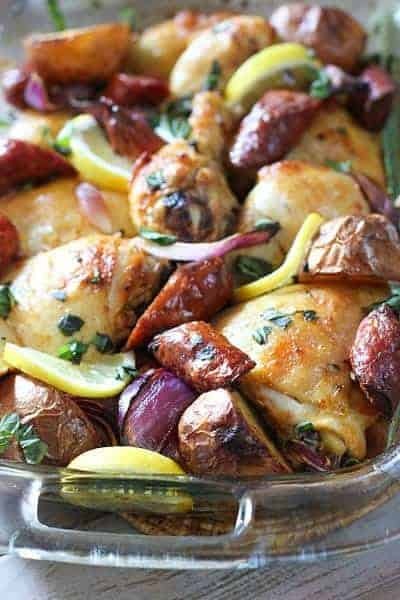 You might also like this one pan Easy Roasted Chicken with Lemon and Rosemary! Same cooking concept, just with a lemon and rosemary flavor! A one pan easy roasted chicken dinner! Fresh chicken, sausage and an easy marinade you pour over the top right before baking! 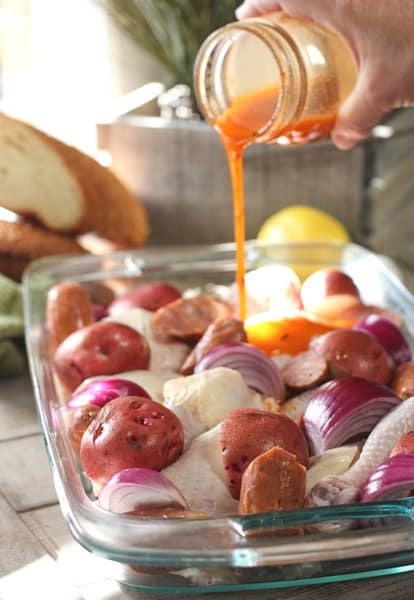 Arrange chicken, sausage, potatoes and onion in a 9 x 13 inch baking pan. Combine marinade ingredients in small bowl. Pour marinade over chicken and toss to coat. Bake one hour or until chicken reaches 165 degrees and potatoes are tender. Whole small potatoes work great. I couldn't find them at my store so I bought larger ones and just cut them in half. You want them rather large so they don't get over cooked. Don't have smoked paprika? Just use regular but I do like the smoky flavor it imparts. What ratio of olive oil to lemon juice do you use for the sauce? I’m new to making my own sauces and am not sure where to start. Approximately how much garlic and paprika? Thanks!! Ha! You didn’t misunderstand. Sorry. I was initially looking at the recipe on my phone and the link to the recipe was hidden. I found it on my laptop. Can’t wait to make this tonight!! Thanks! What type of marinade did you use in this recipe? Hi Jennifer! Lemon, olive oil, garlic…it’s all in the recipe! Is it possible to make this with a whole chicken? If so, what would need to be adjusted? Hi Kayleen – A whole chicken takes about 1.5 hours to cook. Your potatoes and sausage would be well overdone. Can’t recommend it since I have not tried it. You can always just cut up your chicken in quarters which would be fine! Do you think I can freeze the leftovers? I have never frozen potatoes but I know the chicken and sausage would hold up well! Does it matter if the chicken is skinless? I prefer my chicken skins to crisp up. The recipe uses skin on chicken. Maybe I misunderstood the question…but regardless, skin on or off it will work! Hope you love it! I am always looking for dishes to make for when my mom comes over! She loves her meat and potatoes! This looks like a fun recipe! Hi Cindy – hope your Mom loves it! Thank you for the note! Hi my question is do you cover the dish at any time and if so for how long. It looks like a great dish my family would love and with my time in the kitchen and heat I would like to get a idea, I have epilepsy so this is easy and perfect for me to make. Hi Margaret! No need to cover. Leaving it uncovered allows the chicken and potatoes to crisp up. Wishing you good health! Thank you for your note. Hi Fern – Step 1 on the recipe card. 400 degrees. Thanks! This is such a great combination for a delicious meal. The marinade looks so flavorful. Thank you Molly! I love your blog and appreciate the note! Love the one pan concept for cooking and the ingredients. I have a rosemary bush right outside my front door and picking up the spuds, sausage & chicken for tonight’s meal. Thanks for the new recipe & helping plan dinner for tonight! What a nice comment! Thank you so much! This is the way my kitchen ticks too – recipes like these are always a keeper and now I am off to shop for the ingredients! Thank you Meeta….I love the name of your blog! Made me smile! You never fail me! Your recipes are simple, healthful and delicious! I made this tonight for my family and they loved it. My husband makes home-made sausage (I know, what a hobby! ), so I used that, and as you said, even though it was raw when I put it all in the over, it was cooked perfectly after an hour. They were feeling pasta-y, so I didn’t use potatoes. I stirred the yummy sauce into some rotini when it was all done, placed the chicken and sausage on top … And I was a hero chef on a Thursday night! Oven… Not over. Must’ve been MY skinny fingers, haha!